The next leg of our journey, heads along the Terai Plains, which border India, Nepal's southerly neighbor. This area, the breadbasket for Nepal, is also the home of Chitwan National Park, where we will spend our next couple of evenings. And perhaps, during an optional elephant back trip into the park, you may spot rhino or the elusive tiger. We will also visit the UNESCO World Heritage Site of Lumbini, the birthplace of Siddhartha Gautama, who we know today as Lord Buddha. Turning northward, we venture back towards the Himalayan foothills, pedaling first to the medieval town of Tansen, perched on the ridge overlooking the Kali Gandaki River. Then onto Pohkara, with its dramatic backdrop of the Annapurna Mountain Range, one of the most magnificent vistas in the world. We relax here for a day before flying back to Kathmandu. Arrive Kathmandu, enjoy walking tours of the temples and market squares, shuttle to Daman Pass on Day 2. We'll gather today in Kathmandu. After checking into our unique boutique lodge, Dwarikas, we leave you free to explore or relax, as your guides gather the rest of your fellow riders. You will start your tour with traditional Nepalese music and dance during our welcome dinner at a renowned local restaurant in Kathmandu. Kathmandu awaits you this morning, as we head out to explore some of this ancient, colorful city. Our journey will take us from the awesome Swamyambhunath Temple, to bustling Durbar Marg to ancient Hindu temples where public cremations are still held. Kathmandu is an interesting mix of new and old, with cars sharing the city streets with elephants and monkeys guarding colorful temples. In late afternoon, we will transfer out of Kathmandu to our hotel perched on top of Daman Pass. 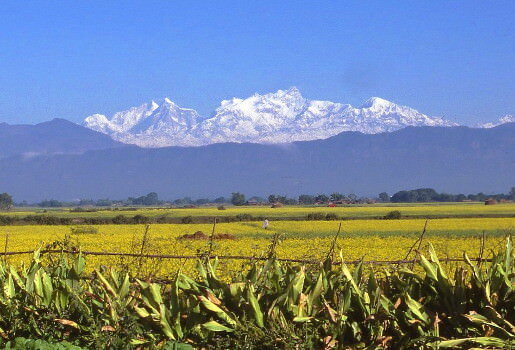 Enjoy sunrise over the entire Himalayan Range, descend by bike down to the Terai Plains. Your wake-up call comes before dawn has a chance to crack. The whole reason for bedding down high atop Daman is to enjoy the awesome view of the Himalayas at sunrise. Before the clouds settle in, you will be able to see the entire length of the range from Everest in the east to Dhalagari in the west. Then it's a big downhill bicycle tour to our next overnight stop in Hetauda. Biking across the Terai Plains, flat farmlands covered with yellow fields of canola plants, bed down in Chitwan National Park. Today's cycling tour takes us across the Terai Plains, Nepal's breadbasket. 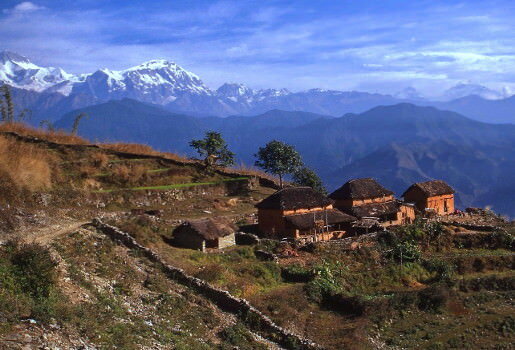 This agricultural region sits slightly above sea level, providing a stark contrast to the high altitude of the Himalayas. We will be sharing our roads here in the Terai Plains, with hundreds of cyclists, as the Nepalese still use bicycles as a primary form of transport in this region. Afternoon will find us at Chitwan National Park, where we are shuttled deep into the wild grasslands. Explore the park atop elephants in search of rhino and tiger or leisurely nature walks near our safari camp. You have the day free inside the park. Our lodge offers walking tours through the lush forests or elephant back trips in search of the tigers and rhinos that inhabit the parklands. At dinner we can compare notes on what was seen. Cycle to Lumpini, the birthplace of Lord Buddha, learn about his life. After breakfast we will shuttle back out of the heart of Chitwan and down the road a bit before we start cycling. Today's bike tour takes us across more of the Terai Plains to the city of Lumbini, just north of the border with India. Lumbini is the birthplace of Siddhartha Gautama, who later through enlightenment became Lord Buddha, the inspiration for the world's third largest religion. Follow the historic Siddharta Highway, ascending the foothills with glimpses of the Himalayas as we ride. We leave the flat Terai Plains behind today, as we roll back towards the foothills of the Himalayas. As we did leaving Daman, we will be following one of Nepal's older highways, the Siddharta Highway, built originally to connect India and Nepal but no only carrying local traffic as it winds through the valleys and mountains, en route towards Pohkara. Tonight will be will bedding down in historic Tansen, in a hotel perched on the ridge offering great views of the Annapurna Mountains. 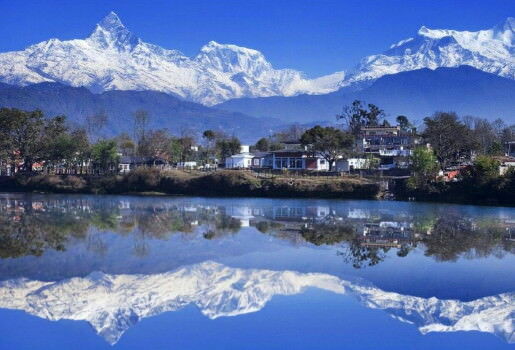 Descend into Pokhara, enjoy a full day to explore this lake side town backed up by the towering Annapurna Mountains. Our last and longest ride of the Nepal bike tour, takes us further through the foothills to colorful Pohkara, with its lovely lake in town center and a backdrop of the towering Annapurna Mountains. You would be hard pressed to find a town with a more dramatic setting. The day is free today, allowing you time to explore Pohkara or perhaps joining your guides for a hike to nearby villages offering spectacular photo opportunities. If you want some more miles on your bike, there are options here as well. 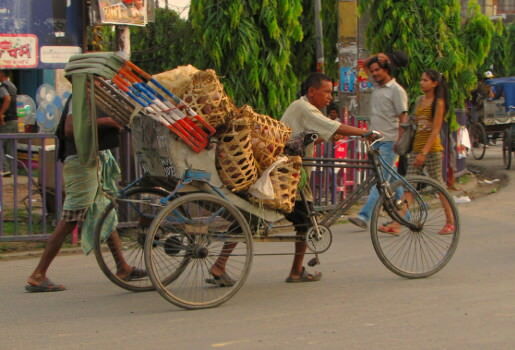 In late afternoon, we will pack the bikes, as they head by truck to Kathmandu tonight. Fly back to Kathmandu, with free time to visit markets or relax poolside, Day 11 depart. We take the easy way back to Kathmandu today, catching a flight from Pohkara. The balance of the day in Kathmandu is free to explore some more of the city, or shop for those mandatory gifts for your house and pet sitters. We'll end the tour with another evening of Nepalese music and dining in Kathmandu. As they always say ... all good things must end. We'll shuttling you back to Kathmandu Airport to catch your outbound flights back home or on to more adventures. All costs per person in US $. Seasonal supplements may apply on private trips. One of Kathmandu finest boutique lodge, heritage stylings with modern conveniences. Resort hotel perched dramatically atop Daman Pass with unmatched panoramic views of the Himalayas. Simple hotel set in nicely landscaped gardens. Bungalows situated inside the confines of Chitwan National Park, simple but with modern amenities. First class city hotel with Nepalese palace stylings. Moderate class hotel situated with views of the Annapurnas. Delightful circular bungalows in a resort complex on its own island in Pokhara Lake with magnificent views of the Annapurnas. The hotels listed here are our preferred properties, but may not be available for all dates. When alternates are used, they will be of the same quality and style. Fill in the blanks and the tour details for Nepal Bike Tour will be on their way.